A long time ago, when it was still believed that the world was flat, there lived a man named Ferdinand Magellan. 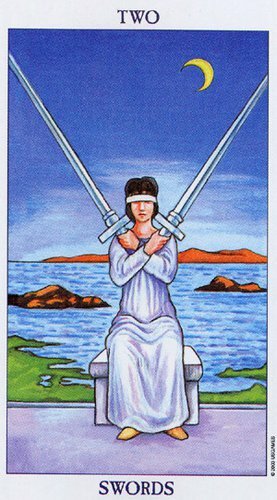 Like the figure on the two of Swords card, Magellan needed to make a choice – blindfolded in a sense – with no guaranteed outcome. A choice that would require a huge leap of faith, given the times he lived in. Magellan decided to sail around the world, without any knowledge of what may await him or his crew. To not do so, I imagine, would have been to choose an almost certain fate in mediocrity. Against all odds this man Magellan convinced a crew to join him as he set off to become the first person to circumnavigate the earth. He and his crew were met with many challenges. Most of his crew did not survive this dangerous mission, and yet, they chose to face the dangers of the high seas, and the possibility that they might fall off the end of the world, in order to challenge themselves and change the world as they knew it. All choices have consequences, and today’s card reminds us of this. When faced with a choice we seldom have guarantees regarding the outcome, but we do know that all choices have consequences. The consequences for Magellan and his crew was that many of them would not make it, many would die in the attempt. But, Magellan made it, he succeeded in being the first person to circumnavigate the world, a victory that would not have been possible without a huge leap of faith on his part, and a willingness to face whatever consequences arose from his choice. Our daily choices may not necessarily be as dramatic as Magellan’s was, but we occasionally find ourselves in positions where we really do not know what the outcome of our choices might lead to. It is at times like these that a leap of faith is needed as well as a healthy understanding that we need to be prepared to live with the consequences of our choices. The figure in the card is blindfolded, she is flanked by two swords, a decision or choice must be made and she cannot begin to see the outcome of either. Yet, the only way out of breaking this deadlock is to take the plunge and chose one or the other. Even the wrong choice is better than no choice. After we choose to get out of bed in the mornings, we choose to either approach our day with dread or desire. How do we choose to project ourselves onto our world today? Do we tackle the less-desirable or difficult tasks that we have left for last, or do we get them out of the way first? Do we choose to live in appreciation of the beauty that surrounds us, even on the subway or in the concrete jungle of our cities? Do we choose to frown or smile at strangers. Have you ever noticed how much better that first cup of coffee tastes in the morning when you sip it with a song in your heart rather than a black mood stifling your thoughts? If nothing else, today’s card reminds us to make conscious choices though our day, without guarantee of reward or outcome. One never knows what a difference even a small positive gesture can make to someone who crosses our path, however briefly. Like Magellan’s it may even change someone’s world for the better.